When the 911 street naming requirement came to pass, many of the roads intersecting Nickelsville Highway in this area were named in Snowflaky ways, like Sleighbell, Icicle, Bobsled, and the like, until you get closer to Gate City and the roads have names like Revolver and Mcred. Unsentimental types, those. I always liked Snowflake and the two mature ladies that ran the store. I hope they did well when it was abruptly shut down. As we were walking around (it was on a Sunday), a man bounded out of a local church, handed me a tract and proceeded to tell me a little about the town. Much appreciated, sir. So, there we were, rolling down highway 750 in Washington County VA, on our way to Saltville, when we came across this 500′ long amazement: Stoney Point Railroad. Read about it here. However, nothing beats seeing the SPRR in person, by donation. What a place. It’s at 36.84999, -81.79882. I call it São Paulo, for no particular reason. We pass through here all the time, often a local Marathon outlet is a place Hiking Buddy does a “pee and tea”…taking a pee and buying an over-sugared (I don’t do sugar) bottle of some strange flavored tea, which he always says is too sweet. Anyway, in 1939 the Norfolk and Western (now the Norfolk and Southern) and the Clinchfield (note that it’s “Norfolk and Western Railway” but “Clinchfield Railroad“…must be a story there.) got together to relieve the town of a chokepoint, to wit, where 4th street crossed the railroad. Instead of raising the railroad, which would have proven to be complicated, the lines just lowered the street. Works well, Shot one is of the underpass from the town side, then a cu of the inscription (the 1939 date is there, but it’s relatively tiny). On to a look at the historic Stonebriar Hotel and then the Lyric Theater. St. Paul was the place to be once upon a time when coal was king. And it’s still a pleasant, well-kept town. Next is a look down 4th Street and a shot of one of two business/apartment buildings we noted that had open terraces for the people on the second floor. Neat idea. Back in 1912, according to a letterhead shown in James Goforth’s “Building the Clinchfield”, this was the Blue Sulphur Hotel, “Home for the Man of the Grip” (makes no sense unless you know that “grip” meant “suitcase”). “A Well of Blue Sulphur Water at Entrance Free to Guests” (ick). Rates were $2 and $2.50 (the extra 50 cents got you a room with a bath). “An elegant, high-toned stopping place for travelers.” Acetylene light. Telephone in each room. And this is the old Lyric Theater. I was born here. And it was before the second story sidewalks were installed. We lived six blocks from downtown, on Main Street. The house is long gone, but it was a pretty, two-story, white stick-built home. Nice yard. All compound things are impermanent. The first picture is of Main Street downtown, on the upper sidewalk, looking east. The second is of an old paint-up sign for a newspaper, the Gazette & Mail. The other newspaper in town was The Sun. Both of my brothers worked for it at one time or another. 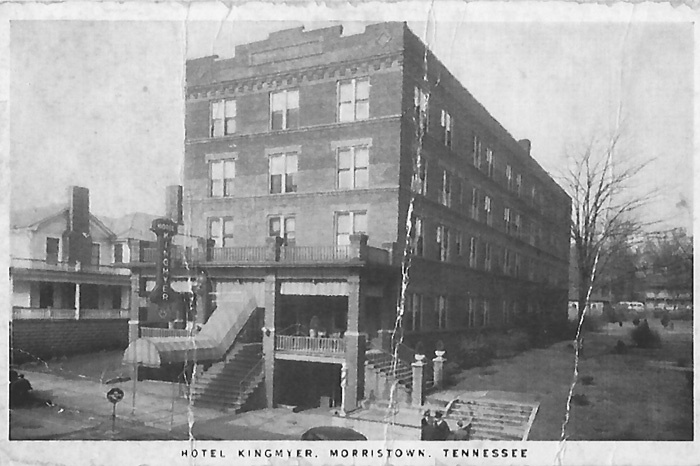 The third picture shows the location where the um, well, stately Kingmyer Hotel once stood. I have included a scan of an old, damaged postcard of the hotel as it once was. When I first returned to Morristown, after an absence of maybe 25 years, I was shocked at how small all the buildings looked. The last time I had seen them, after all, was when I was considerably shorter, at 12 years of age.